As the temperature outdoors drops and heating bills rise inside your home, you might be wondering how to seal windows. After all, leaky windows—especially in older homes with single-pane designs—can cause drafts in your home. And the impact on your energy bills is nothing to sneeze at, either. Start by examining windows for leaks. “It can be as simple as feeling around the edges of the frame on the inside to see if there’s a lot of cold air infiltrating,” says Kathy Hopkins, a community educator at the University of Maine Cooperative Extension. Another tactic is to light a candle and move the flame around the edge of the frame a few inches in from the wall. Where the flame wavers is an indication of moving air. Don’t want to play with fire? Use a lit incense stick or a 3-inch strip of single-ply toilet paper, which will wave when you come across leaky spots. Once you know where the leaks are, you can seal or block them (more on that next). As windows age, seals can shrink or crack between windows and walls, panes and frames, and even panes and other panes. That’s when a new bead of silicone caulk will help. Make sure you remove the old caulk first—never caulk over caulk—then take care to cut the top of the caulking tube at a 45-degree angle to match the width of the caulking bead you need. (Note to readers: That sentence just set a world record for number of usages of the word “caulk.” Yay!) The closer you cut to that tapering tip, the thinner the bead. If the gaps you’re caulking are wider than a quarter-inch, fill it first with a long, skinny piece of foam called a backer rod, cutting it to the right length, then pressing it in place with a putty knife so it’s about an eighth of an inch below the surface. Then caulk over the foam. Here are more tips on how to caulk (which can come in handy for sinks and bathtubs, too). 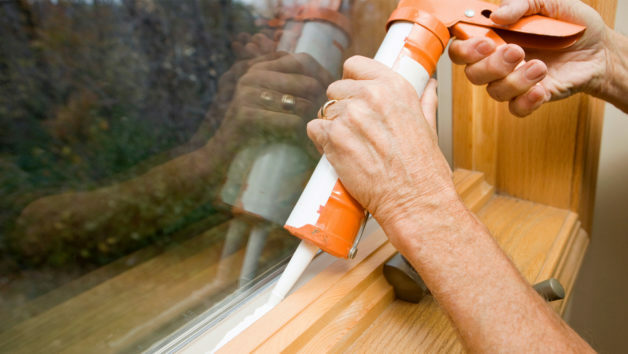 For areas around windows (and door frames for that matter) that you can’t caulk because they’re moving parts, weatherstripping is the solution to keep cold at bay. The trickiest part of weatherstripping is picking which type is best for your project, so here’s a primer. V strips: These folded metal or plastic strips (often adhesive on one side) fill the gaps on the sides of windows that slide up and down. Felt: Felt is best nailed or stapled in place along window sashes (sashes are the top and bottom edges of windows that slide up and down). As an added barrier against cold, add drapes or shades to your window and keep them closed, particularly at night. The thicker the fabric or material, the better an insulator it will be. However, to really keep out drafts you will want to cap your curtains with a cornice or ruffle across the top. According to Hopkins, this keeps warm air from seeping behind the window treatment and into the great outdoors. Here are more details on how to hang curtains. If you are looking for more information about keeping your home warm in the winter, head to a local hardware store and ask for their expert advice!